SportsLine's computer model called 12 of the 18 first-round upsets by double-digit seeds the last three years. It seems to happen every year. NCAA Tournament brackets everywhere are busted after the first weekend because a No. 12 seed upsets a heavily-favored No. 5 seed. There are endless theories about why a 12-seed always seems to upset a 5-seed during March Madness. Is it because 12-seeds are typically underrated mid-majors? Or because 5-seeds often don't get to play close to home like top-four seeds do? Whatever the reason, one thing is clear: the 12 vs. 5 upset is one of the most popular picks for college basketball fans filling out their NCAA Tournament brackets. And for good reason, too. In fact, there have been 47 upsets by 12-seeds in the first round since the NCAA tournament field expanded in 1985. Plus, a 12 seed has won at least one first round game in 29 of the last 34 years. No. 12 seeds are an impressive 25-18-1 against-the-spread since 2008, while also going 18-26 straight-up during that span. However, the 2018 NCAA Tournament was just the fifth time that every No. 5 seed advanced to the second round. Despite last year's clean sweep, history favors a 12 upsetting a 5. That's why you'll want to see the optimized bracket from SportsLine's advanced computer model before locking in your 2019 NCAA Tournament picks. The model, which simulates every NCAA Tournament game 10,000 times, has nailed 12 of the 18 first-round upsets by double-digit seeds the last three years. It called several noteworthy upsets last year, including huge wins by No. 13 seed Buffalo over No. 4 seed Arizona, No. 11 seed Loyola-Chicago over No. 6 seed Miami and No. 10 seed Butler over No. 7 seed Arkansas. Getting these upset picks right could make or break your entire March Madness bracket. This year, the 12-seeds are Liberty (+7.5 vs. Mississippi State), Oregon (+1 vs. Wisconsin), New Mexico State (+7.5 vs. Auburn) and Murray State (+4 vs. Marquette). Based on the spreads, oddsmakers give Oregon the best chance to advance. The model is extremely high on one of the 12-seeds, saying they go all the way to the Sweet 16. Will Ja Morant lead Murray State on a Cinderella run? Will Liberty extend its 28-win season? Will Oregon, the Pac-12 conference champ, give Wisconsin another early exit? 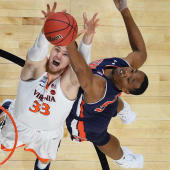 Visit SportsLine to see the optimized NCAA Tournament bracket, and see which underdogs to lock in now, all from the model that has nailed 12 of the 18 first-round upsets by double-digit seeds the last three years.